What if This Week’s Rally in Gold is Already Over? In yesterday’s analysis, we explained how it’s possible for the precious metals sector to move higher in very short term and at the same time still form the next local bottom close to $1,250. The key part of the analysis was that this week’s turning point may turn out to be declines’ starting, not ending. We also argued that we could see a small decline in the USD Index and that might be enough to cool down traders’ emotions. It seems that we have seen just that, and now the question is: how soon can we expect gold to decline? We can see it even today. Gold’s and silver’s apex-based turning points are today and tomorrow and since they confirmed their usefulness so many times, one should definitely be paying attention. Still, let’s keep in mind that the above are turning points, not decline start points. 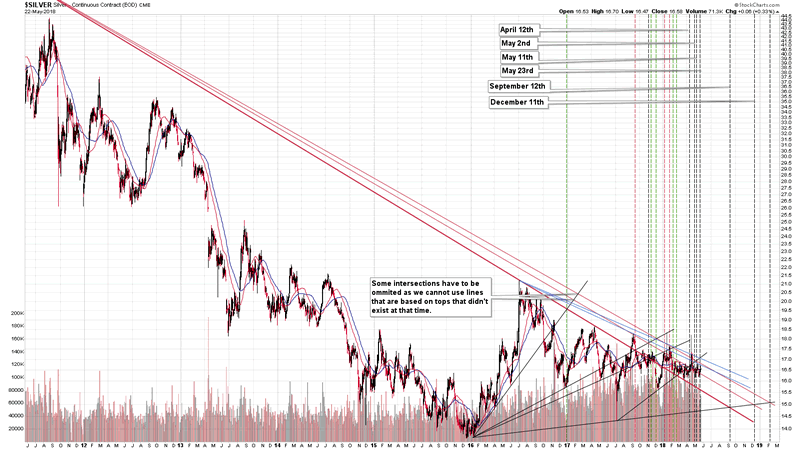 This means that we could still see a rise in metals and miners today or tomorrow and a decline shortly thereafter. In fact, this would be to-the-letter interpretation of what the turning point is. This scenario is not necessarily imminent, and we could have seen a top yesterday, as the lines that constitute the triangles on which we base the reversals, are based on years of data and thus if they are off by a one trading day, it’s still a remarkable precision. Let’s check the short-term developments for confirmations and invalidations of the above scenarios. If you’re wondering why we would be looking for invalidations instead of focusing purely on confirmations, please note that this is exactly what makes one’s predictions more reliable and less vulnerable to errors. By just looking at signs that confirm one’s point of view (like the vast majority of gold promoters do) we would never be able to detect the change in the trend on time. Looking for confirmations and getting them may be pleasant, but it is getting invalidations that generates most value. Once detected, they can be analyzed, and they could change the position to what’s likely to be most profitable going forward, not what’s in tune with the information that was available several days or weeks ago. In other words, we care about your investment success and thus we constantly test our previous thoughts in order to always provide you with what’s most up-to-date. Let’s start with the USD Index. 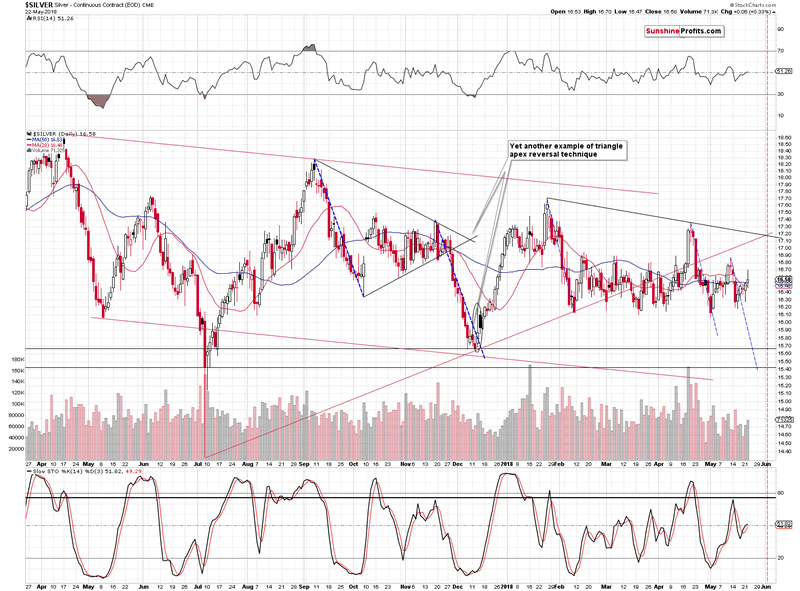 We previously wrote that the next two target prices for the USD Index were at about 94 and 95. The former is provided by December 2017 top and the latter is based on the October / November top. The 94 level seems more important as it is strengthened by the August and early October tops and the 38.2% Fibonacci retracement level. The USD Index just moved to the lower of the above-mentioned targets and thus in yesterday’s analysis we wrote that we can expect a corrective downswing. And it happened. Some may say that the corrective downswing was way too small to correct anything, but the king doesn’t agree. It is said that the context is king, and this phrase perfectly reflects what one needs to take into account right now. If the current rally in the USDX is to continue to be similar to the 2014 one (and this seems likely in our view), then we shouldn’t expect a major weakness anytime soon. Surely, there will be some local pullbacks, but most likely nothing that’s particularly visible from the long-term point of view. Moreover, please note that the RSI is not yet overbought from the long-term point of view and back in 2014 and 2015 the rally didn’t end even when it was extremely overbought. 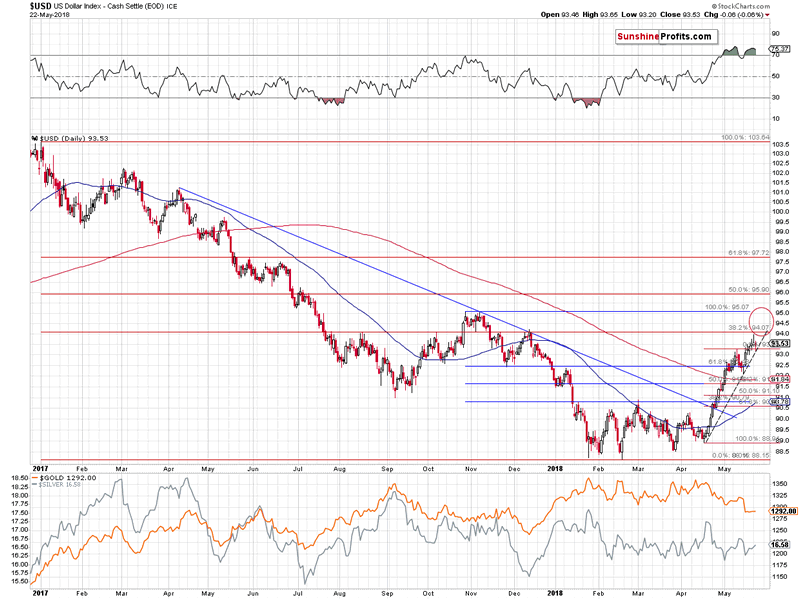 So, should we really expect a major decline in the USD Index shortly? Not really. 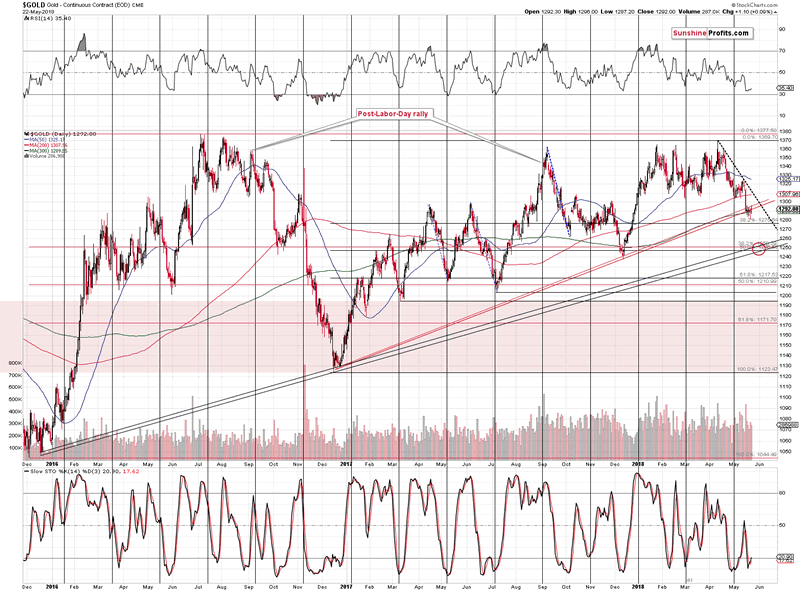 The short-term USD chart includes a rising dashed support line that’s based on the most recent local bottoms. It was just reached, so perhaps the decline that was likely to be seen based on the 94 level, has already taken place. This means that we shouldn’t count on a big upswing in metals and miners just because USD’s rally in the past few weeks has been big and sharp. 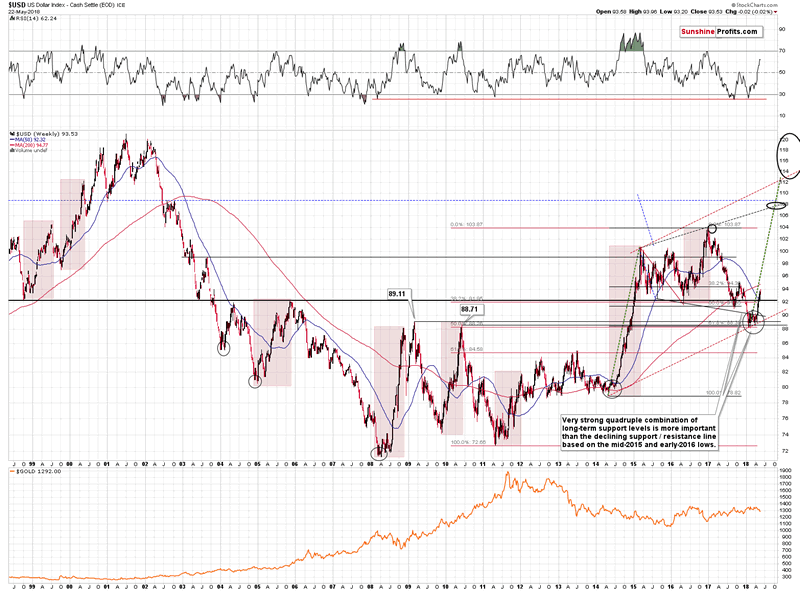 If the above-mentioned downswing in the USD Index has already materialized, we may have already seen the top. If we didn’t and the turning points are going to generate a more visible upswing, then its size is likely to be limited anyway. The analogous line to USD’s rising support is the declining dashed resistance line and it points to resistance at about $1,310. The additional resistance is provided by the previous lows between $1,303 and $1,309. 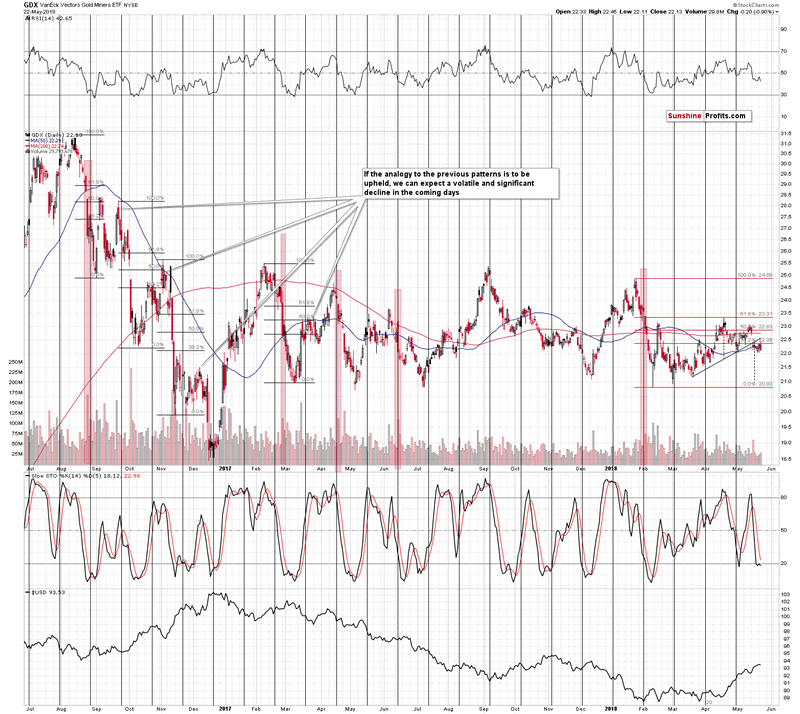 Consequently, we may be looking at a rally of maximum $11 - $18. This may appear tradable at first sight, but let’s keep in mind that this level could be reached on an intraday or overnight basis only and that the follow-up move could be very sharp (note the early October 2016 decline that happened from more or less the same price levels). Moreover, please note that gold didn’t magnify USD’s downside move on Monday and it didn’t do so yesterday. If gold was really about to soar, it would have been likely to multiply USD’s downswing by rallying more and closing the Monday session visibly higher instead of just reversing and it would rally strongly amid declining USD yesterday. 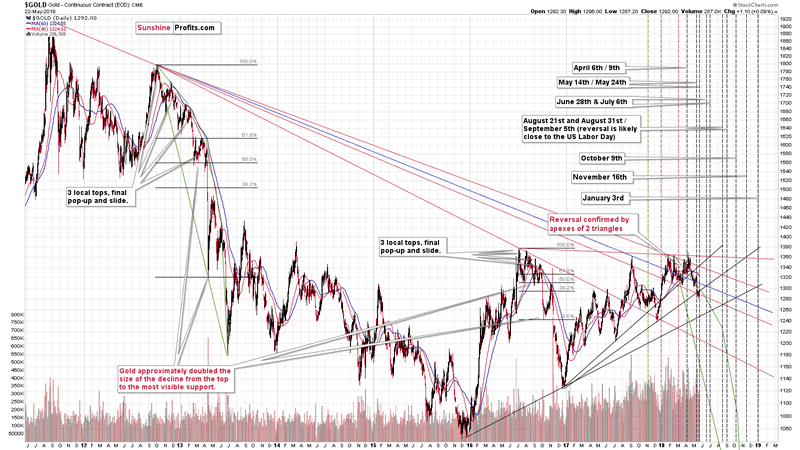 Consequently, there is no reason to expect gold’s upswing – if it materializes at all – to be anything to call home about. While gold hasn’t done much recently, the white metal definitely moved higher also during Monday’s and yesterday’s sessions. As we mentioned many times, silver’s short-term outperformance is not a bullish sign – conversely, it’s something that indicates looming declines. Silver also tends to rally in a visible way just before turning south and we have already seen this kind of performance on Monday and yesterday. The above is already bearish, but let’s keep in mind that it doesn’t necessarily mean that the outperformance is already over. Consequently, the very short-term outlook for the white metal is rather unclear. We might see a big plunge shortly, but we may also see a move back to $17 or so before the downswing materializes. Normally, “when in doubt, stay out” rule applies to such situations, but in this case, it may be interpreted as “when in doubt, stay out of very short-term trading and stick to what’s very probable in the medium term”. If we have just several months during which PMs are likely to move much lower, then the surprises are going to be to the downside and these surprises are going to be huge. Before moving to mining stocks, we would like to point out the fact that there is a medium-term apex-based reversal close to the end of the month, so if the decline starts shortly (today or tomorrow), then we can expect to see another turnaround in a week’s time. Silver’s quick outperformance is one of the reliable topping signs and mining stocks visible underperformance is another one. After a temporary move above this week’s highs, the GDX ETF reversed and closed at a new monthly low in terms of the daily closing prices. This is a strong and clear sign of underperformance, especially when compared to what happened in silver. The implications are strongly bearish. The silver to gold ratio moved once again to the previously broken rising resistance line and more or less the previous local top. It actually moved a bit higher, but the previous two verifications of breakdowns took form of moves a bit too high, so the current performance doesn’t seem to indicate anything bullish for the ratio. Moreover, since it’s at the level that previously made it reverse and confirmed a major top in gold, the implications are actually bearish. 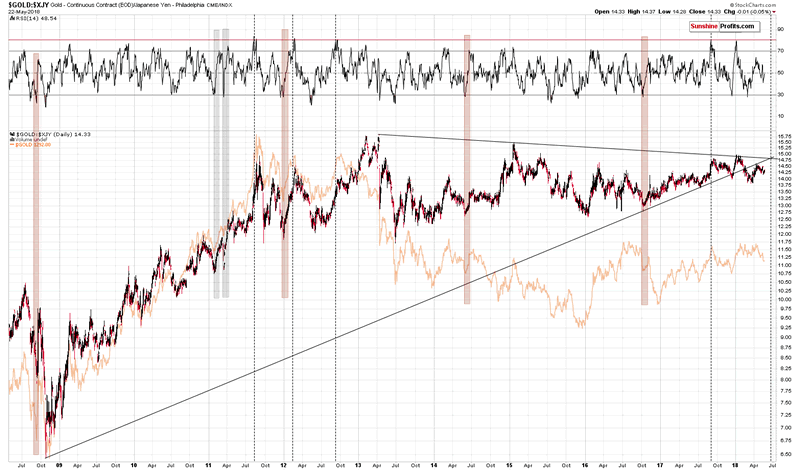 Also, please note that the RSI based on the ratio is getting close to 70, which is a topping territory. 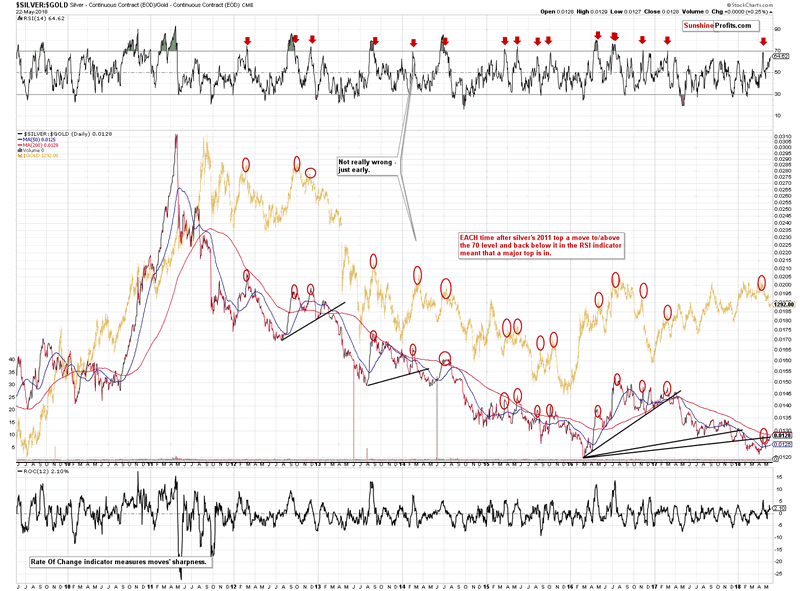 Practically each time when the RSI moved above 70 and then back below it, we saw a major decline in the prices of precious metals. The indicator is not above 70 yet, but if silver continues to outperform, that’s the kind of signal that we might get in the coming days. Still, based on what we discussed earlier in today’s alert, it seems more likely that we’ll see a decline even before RSI manages to move above 70. As far as the signal from Japan is concerned, we mean the additional confirmation of the apex-based turning point at the end of the month. Very long-term triangle has apex there in case of gold’s price in the Japanese yen and since the latter is one of world’s major currencies, it’s definitely something that one should pay attention to. At this time it seems that the turnaround will be the next bottom, but it will be more important to stay flexible than to stick to this interpretation and it may change as we move closer to the end of May. Summing up, based on Monday’s and yesterday’s sessions, as well as gold’s and silver’s apex-based turning points, it seems that we’ll either see a decline in the precious metals market right away or tomorrow. Based on the current medium-term trend and the strength of the signals that confirm it along with the doubtful strength of the possible upswing before the decline, it seems that the bearish outlook remains justified. If you enjoyed the above analysis and would like to receive free follow-ups, we encourage you to sign up for our gold newsletter – it’s free and if you don’t like it, you can unsubscribe with just 2 clicks. If you sign up today, you’ll also get 7 days of free access to our premium daily Gold & Silver Trading Alerts. Sign up now.